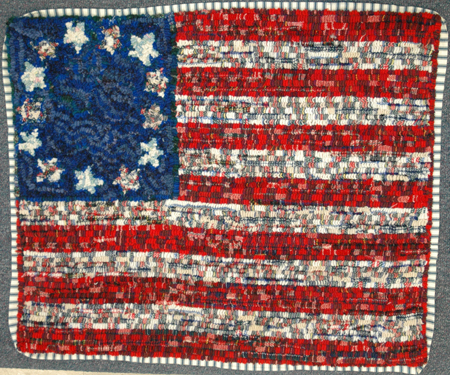 Rug hooking fits into the “waste not, want not” mentality. 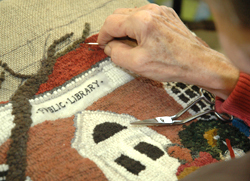 Using recycled wool from clothing and remnants from textile mills, rug hooking was once common in households along the eastern seaboard in New England and Atlantic Canada. The technique is still used to create colorful floor rugs, table mats, pillows, and wall hangings. In late March, Millie Rahn and I drove out to S. Dennis to attend a meeting of the Cranberry Rug Hookers’ Guild. 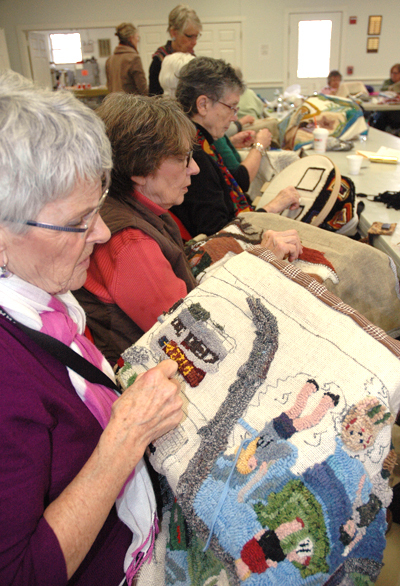 The guild, which is a chapter of the Association of Traditional Hooking Artists ( ATHA), meets at bi-monthly “hook-ins” to work on individual rugs, learn from each other, and socialize. When we arrived, guild president Kathy Blake-Parker welcomed us and invited to partake of the snacks in the kitchen – fresh fruit and vegetables, dip, baked goods, coffee and tea. A group of about 25 women were busy working on their individual rugs or mats. 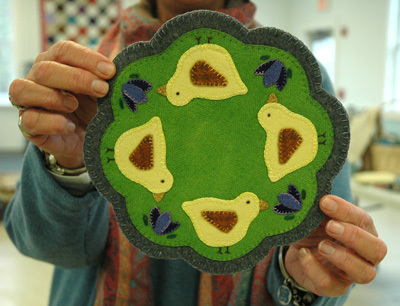 Some members were working on projects other than rug hooking, including knitting, felt applique, and punch cut embroidery. Penny rug made for mat swap by Lucy Labor. 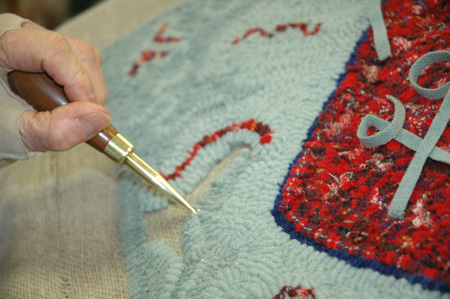 Rug hookers work on a small frame, using a hook to pull strips of cut wool or other fiber through a loose weave, such as burlap. 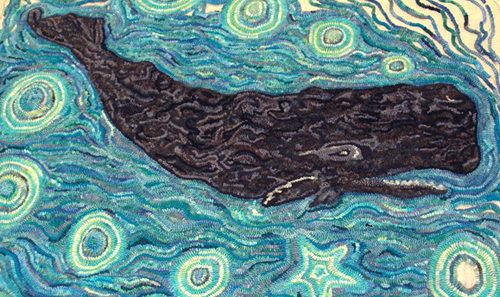 “It’s like coloring with wool,” says Kathy Blake Parker. About mid-way through the afternoon, the group did a show and tell. 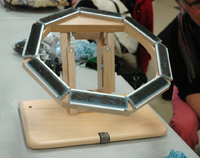 Each guild member held up what she was working on while one of their members took photos. Once this was done, they did what they called a “mat swap” – a version of the White Elephant game people play during Christmas time. Five women sat in a circle holding the mat (approximately 8 x 8 inches square) she had made specifically for the swap. Reading the text of Goodnight Moon, each would pass on the mat upon hearing a previously selected word. When the poem ended, each woman took home the mat she was holding. We went around looking at each woman’s work, engaging some in conversation. Throughout the afternoon, members socialized, worked on their rugs, ate snacks, exchanged advice, and seemed to enjoy themselves. The variety of work was impressive. Some women use commercially produced patterns while others create patterns of their own design. Most everyone re-dyes their wool. 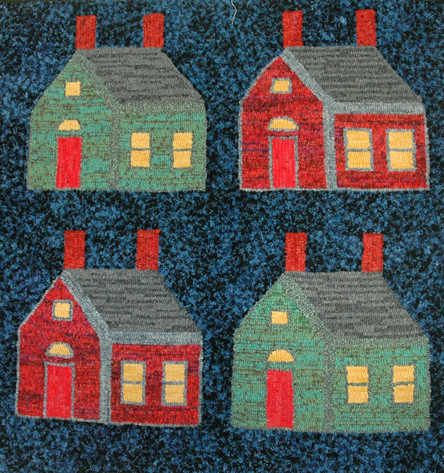 “School Houses” a hooked rug by Sylvia Doiron of Barnstable. 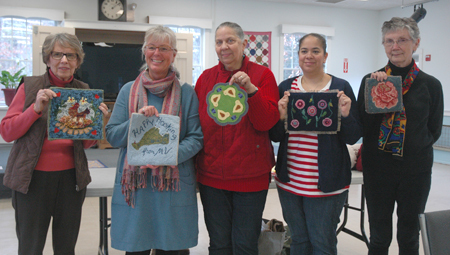 The guild displays their work at the Barnstable County Fair every summer and also produces the Biennial Cranberry Rug Hookers Guild show in mid-May. Two members of the guild will be demonstrating in the F olk Craft area of this summer’s Lowell Folk Festival. Come meet them. Thank you for writing this lovely article about our Cranberry Hookers group. It made me feel proud to be a part of it. Hooking has been a big part of my life for the past ten years. It allows me to be very creative, it relaxes me, and has brought many new friends into my life. 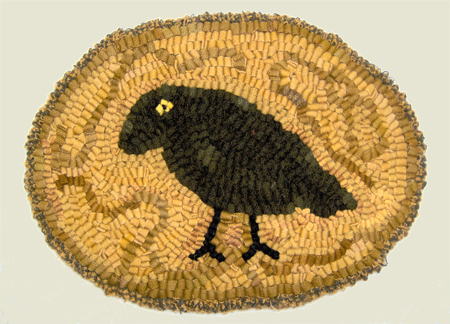 Articles like yours will encourage new folks to start rug hooking and help perpetuate this old craft.